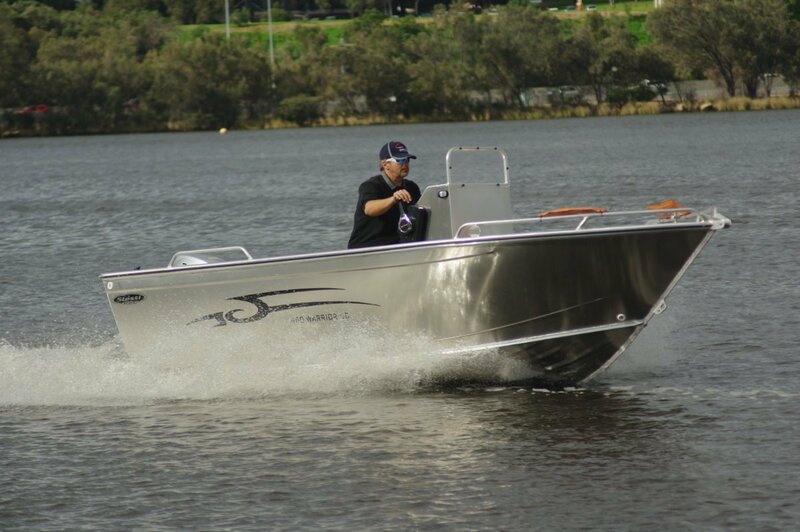 For a boat with a Spartan image the Stessl 460 Centre Console is pretty much a complete fishing rig, although a few conditions apply to “complete”. In a 4.6 metre hull you cannot expect the likes of kill tanks, deck wash and so on. 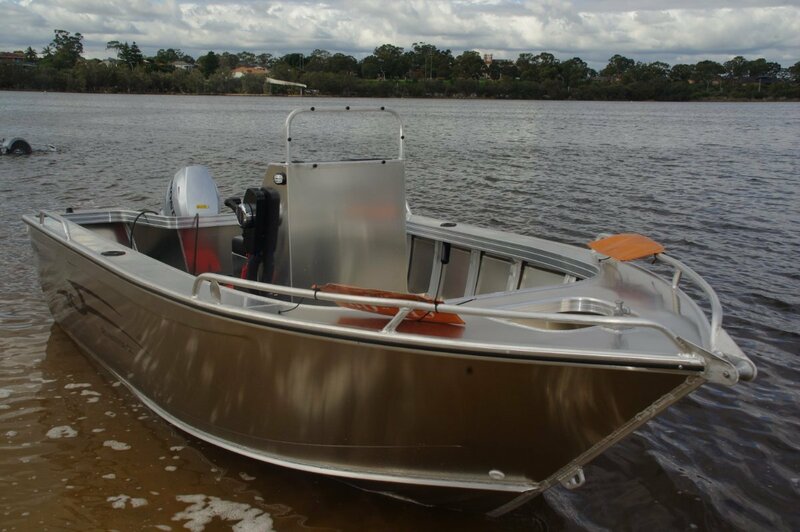 But everything you really need is here, meaning that on top of the all-in price of $29,655 all you have to spend is the cost of bait and a few litres of fuel. That assumes, of course, that you already have something to tow it with. Being strictly honest the only specialized fishing fit out items are four rod holders and a bait well, but this boat has other desirable characteristics built in. For instance, a very worthwhile characteristic for a pot hauling boat to own is good stability. The sub branch of the Stessl family the 460 belongs to is well endowed in this department. People moving about, leaning over the side and doing other off-centre tasks cause less destabilizing results than they would in the typical boat of this size. There is, too, a lot of open deck area, which is generally of more use than permanent seating. The forward platform, by raising the deck in its vicinity, effectively increases the total area. It also provides something to sit on without increasing on-board clutter. Keeping the available space clear is a challenge in boats of this size, and consoles are often villains. The 460’s centre console, though, is a pretty narrow structure to allow reasonable passage either side of it. Minimalist in general, it has a brief windscreen with incorporated grab rail, and its internal volume is mostly given up to the battery. The aim here was to move the battery’s considerable mass to a better position for trim purposes. Someone looking for oddment space could fit a net or a removable shelf above the battery. There is more stowage in the partial length side pockets and beneath the anchor well. The latter space is restricted because of the well’s capacity; a well in aluminium rather than the more common plastic. 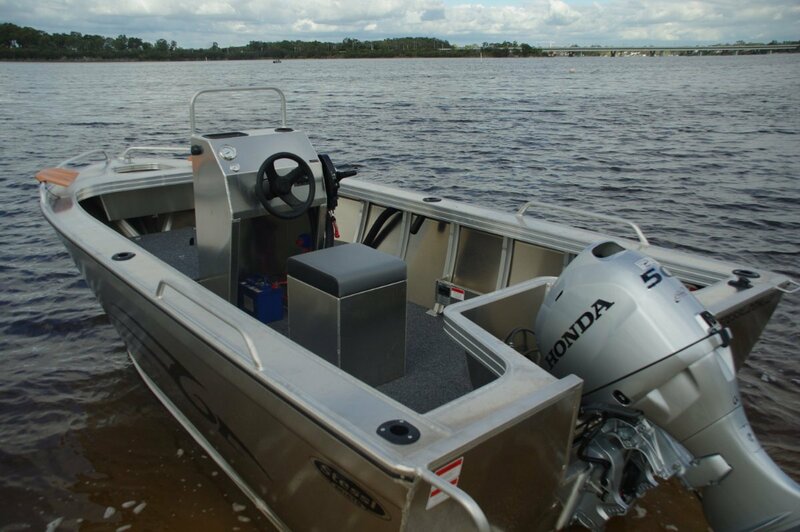 The 50hp Honda proved a good match with the hull, delivering effortless performance two-up. 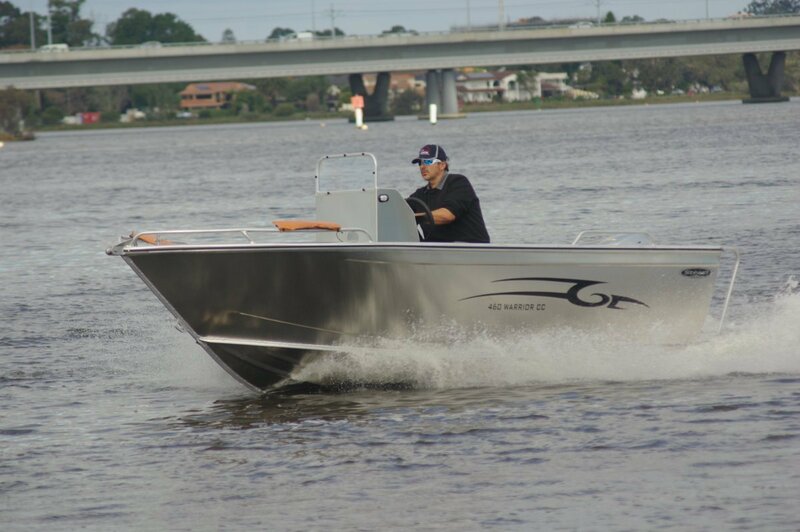 For those likely to use more of the five person capacity, the power can be upped to 60hp. Our 50 had the extra cost but highly desirable property of hydraulic steering. In small centre consoles mechanical steering cables are liable to tight bends causing extra drag. That drag can make hard work out of manoeuvring to pick up crab pots – a task the Stessl is highly likely to be given. Suiting it for hauling things over the side, the boat has no painted surfaces; actually, suiting it for pretty well every purpose. Above a certain size a case can be made for the aesthetics of paintwork, but at the smaller end the economics and practicality of nakedness make a lot of sense. Construction throughout is in 3mm sheet making the Stessl a touch above average in heftiness. The lack of paint makes it clear the parts have been welded together neatly, and also thoroughly. Joints in the less stressed areas are fully seam welded rather than stitched as in some boats. Boats launched from places with no friendly jetty need some means of boarding. Throwing ones belly onto the coaming and then crawling is a common technique, but the 460’s transom boarding step and handrail make it a lot easier. More rails, low profile, are mounted on the sides fore and aft adjacent to likely sitting spots. A boat with nearly everything except size.